Upon the first entrance of Willy Wonka, he pretends to have a limp and falls over, only to bounce up with a smile. So pretending to be handicapped is his idea of “funny.” From this moment the audience knows that there is something “off” about Wonka and that he can’t be trusted. However, the horrific realization that Wonka might actually be sadistic and crazy comes during the first stop on the tour, a room where “anything and everything” is edible… everything, that is, except the delicious chocolate river! Sure, we’re told that Augustus Gloop is a selfish slop, but he doesn’t really do anything wrong at the factory. You might argue that Augustus drank from the chocolate river when he was told not to, but Wonka actually never warns anyone about the river until he spots Augustus drinking from it. THEN, he races toward Augustus, yelling at him not to drink from the river. One can actually argued that by doing this, Wonka causes Augustus to fall into it! What makes this scene especially disturbing is that Wonka does nothing but watch as Augustus appears to struggling for air under the chocolate while he’s being pulled toward a pipe. Now, in the 2005 remake, Augustus swirls around the pipe above water… err… chocolate… before becoming stuck in the pipe. Then the oompa-loompas come out while he’s still stuck in the pipe and sing, “Augustus Gloop will not be harmed.” Augustus even bobs his head to the song, as if he’s enjoying it, making the whole incident seem not so bad. 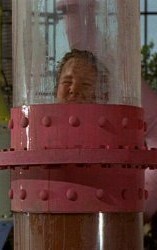 While in the 1971 musical version, Augustus disappears under the chocolate until he appears stuck in the pipe, gasping for air and yelling for help. He is then pushed up into some sort of mixer, which appears to be full of chocolate, NEVER TO BE SEEN AGAIN. The oompa-loopas only then come out and sing a sing basically about how bad Augustus was and how he got what he deserved. Who would have thought a Tim Burton movie would actually be less creepy than a musical made in the 70s! This entry was posted in Creepy Kids' Movies, Willy Wonka and the Chocolate Factory and tagged Augustus, Augustus Gloop, Creepy, family movie, Film, kids' movie, movie review, scary, Willy Wonka, Willy Wonka & the Chocolate Factory, Willy Wonka review, Wonka by timothyheinz. Bookmark the permalink.